CoLab Radio » Blog Archive » How would you support your family on $13/hr or less? How would you support your family on $13/hr or less? MIT student Cassandria Campbell is passing out these postcards as part of her urban planning masters thesis on how Boston residents living near the poverty line make household financial decisions. The City of Boston has set the living wage at $13.02 per hour, sufficient for a family of four to survive at the poverty line. Ten percent of Boston residents who support families earn less than this wage. How would you support your family on an income of $13 per hour or less? 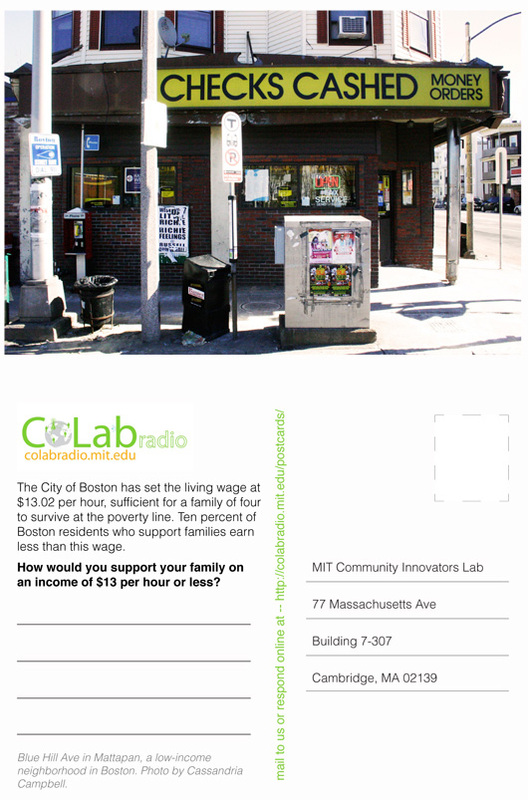 CoLab Radio will send you some cards to distribute in your community if you wish. Email Cassandria at casscamp@mit.edu for more information. The U.S. federal minimum wage is $7.25 per hour. So actually $13.02, when considered in a national context, is pretty high. If I had to support a family of 4 on $13/hour I would leave Boston! In my view, the HIGH COST OF LIVING in this city (rent, childcare, et cetera) is what is oppressing people. Families living here on low wages could have a much better quality of life in other parts of the United States. Tough to support a family on $13 an hour for sure, and even harder to imagine if it were less than that. Ultimately, you’d need to be extremely prudent with your finances and with anything left over become higher skilled in your profession.